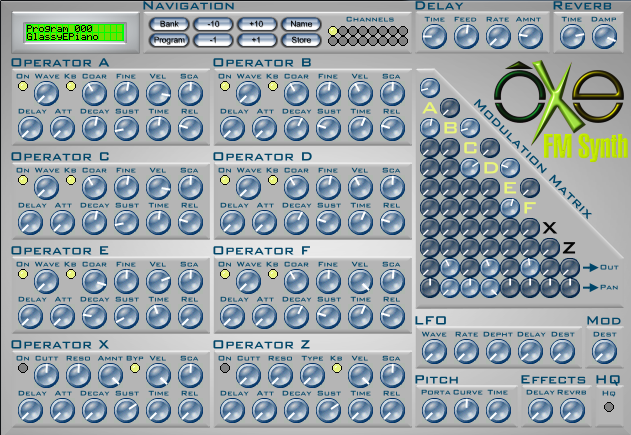 Oxe FM Synth is an open source VST 2.4 instrument plugin for Windows, Linux and Mac OS X.
external skin support (download lcd, snow, tx802 and dx7 skins by Layzer, totolitoto’s skin by David Frappaz and fm8like skin by Alan Wasky). Love this synth and use it a lot, especially for workshop in the Beat magazine. Will there be future updates and/or other synths? Marco, once it is open source anyone can provide updates. Nowadays I’m working on another personal project, so I don’t have short term plans to add new features. The download link is for the 1.3.4 version. Is the 1.3.5 version available for linux? I’ll update the zip soon, and let you know. Say, can this synth be retuned to a system other than standard equal temperament? Nice sounds, by the way! Oxe operator feedback is ‘pre’ envelope ( the amplitude envelope doesn’t influence the feedback amount , which it should. The feedback should be POST envelope. A real shame ,since you can’t get that dx behaviour . also if you use fm8 skin you will notice that every modulation index goes down only to 7, below that it’s zero so you can’t have subtle modulation. I just noticed, the LFO has “Depht”. Hi, just wondering if there’s a pre-built 32-bit version compatible with Mac Snow Leopard? Thanks.